Bliss Balls / Energy Balls or whatever you wish to call them, are everywhere at the moment. Every coffee shop I walk by seems to sell them (at hugely inflated prices). Instead of spending lots of dollars, out and about, on health store / cafe ones, try making them at home. Just whizz up the ingredients in a food processor and roll. 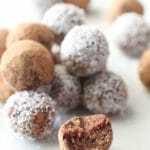 This recipe is easily customised to make Bliss Balls that are tailored to your family’s health requirements or their favourite flavours. Not surprisingly there are thousands of different bliss ball recipes available on line. I’m putting it down to the fact that they are…. 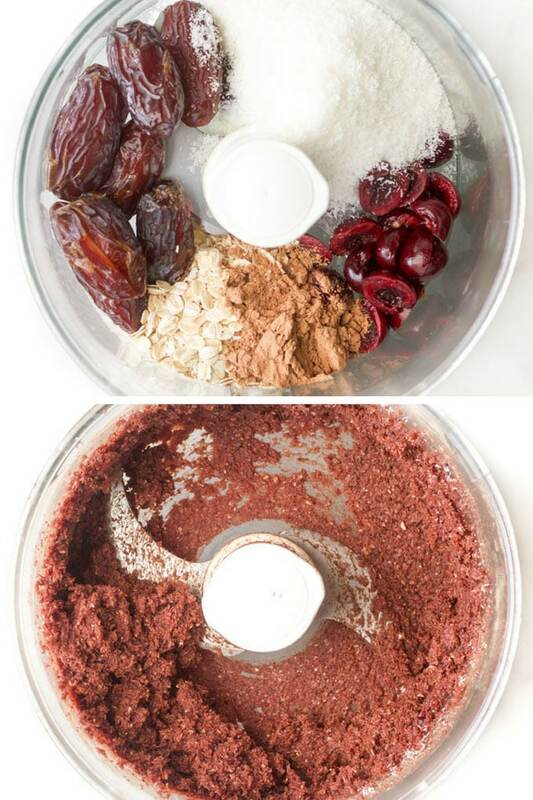 When something is as simple as throwing ingredients into a food processor then I am sold. But are Bliss Balls / Energy Balls Healthy? 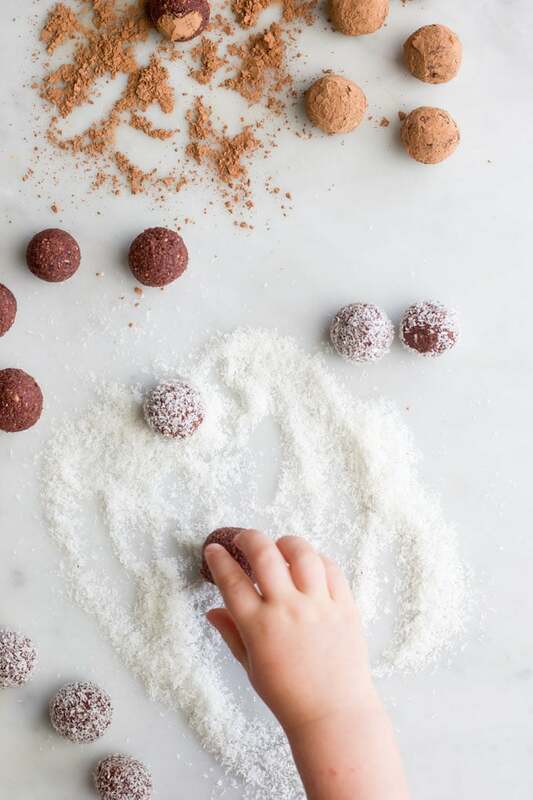 Like a lot of things in life, bliss balls aren’t all created equal. The macro nutrients (proteins, carbohydrates & fat) content can vary immensely from ball to ball. 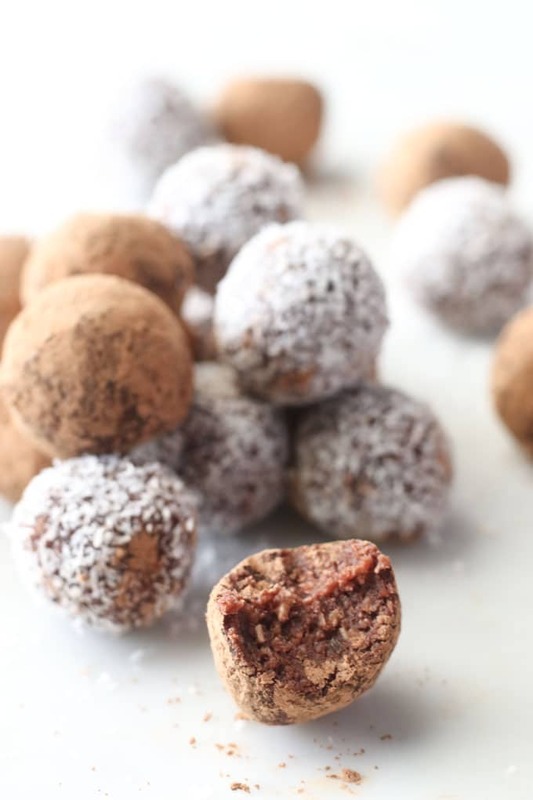 Bliss balls packed with dates, dried fruit, honey or other sweeteners will obviously have a high sugar content and would be considered more of an occasional treat. Balls crammed with nuts, seeds and nut butters will provide a good source of protein and fats for you and your kids’ diet. Balls loaded with oats will provide a good source of carbohydrate and fibre. I would consider this particular recipe a treat. It has a high percentage of dates, making them delicious but high in sugar. For that reason I have rolled them into smaller balls, around 1/2 a tablespoon each. Once rolled you can coat them in coconut, crushed nuts, cocao powder or leave them uncoated. Personally I think the bitterness of the cacao works perfectly with the sweet date and cherry mixture. Both recipes have no sweeteners and very little dried fruit. I call them breakfast balls as they are packed with oats, ground nuts / nut butter and fruit. My prefered method for storing these bliss balls is to pop them in a freezable container and freeze. You can then take them out as needed. You can also store these in the refrigerator for up to one week (if they last that long)! Have you tried any of my ball recipes? I love seeing pictures of your creations. Tag me on Instagram or Facebook! Bliss balls made with cherries, dates, coconut, oats and cocao. Nut free, making them perfect for lunchboxes. Roll into small balls. Mine were around 1/2 a tablespoon each, weighing roughly 13g. I made 28 balls from the mixture. Leave uncoated or roll in some desiccated coconut / cocao / LSA mix / crushed nuts etc. Fresh dates work best in this recipe. If your dates are quite dry and hard then soak them in some hot water for a couple of minutes. This will make them easier to blend. If you are not avoiding nuts then almonds taste delicious in this recipe. Try substituting the oats with almonds. *Nutritional information is an ESTIMATE only, calculated using an online nutrition calculator. Facts are for one, uncoated small ball weighing 13g. Coatings will alter nutritional facts and these should be used as a GUIDE only. I love these kinds of recipes – so easy and delicious yet super healthy! 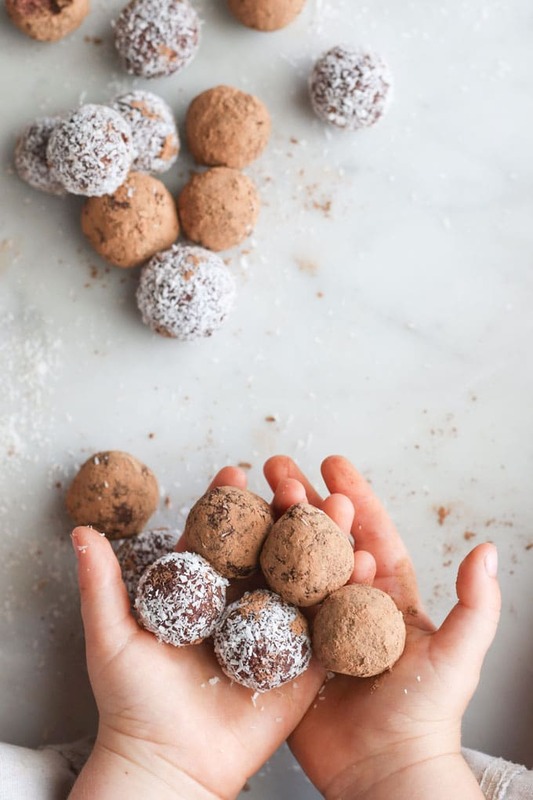 These bliss balls look like the perfect after-workout treat. YUM! Thanks Linda, a double batch sounds like a good plan! You can’t beat homemade energy balls and chocolate and cherry is one of the best combinations. My little girl loves them. Thanks Dannii, I agree – chocolate and cherry is amazing! I too have been seeing these bliss/energy balls at every coffee shop it seems! You’re so right in that they’re so simple (and much less expensive) to make at home. Love the idea of adding cherries! Thank you for mentioning that they’re high in sugar- albeit from dates. So many energy balls are just candy in disguise. Ha ha. Love these pics especially with the wee hands! Adorable! Hi Katie, exactly! These are definitely a sweet treat! So great! Me and my friends love them and it’s delicious. Since cherries are not currently in season, can one use canned cherries? I have never tried the recipe with canned cherries so can’t say how they would turn out. I’m sure they will work well, you may have to up the dry ingredients a little if mixture too wet. Enjoy!